Grandad Science: Fly to Learn! 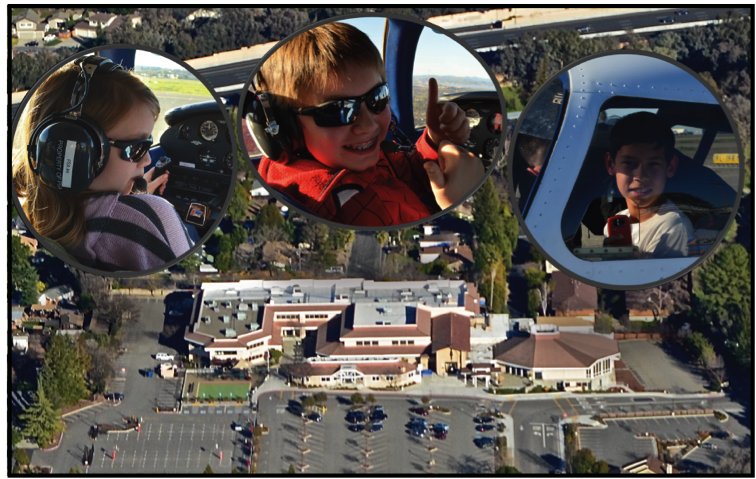 Our two oldest grand kids, Joshua in grade 6 and Jordann in grade 5, have just had their first in-flight, flying lesson. Along with friends Tyler and Bryan, they successfully completed an aviation program, called Fly to Learn, developed and taught by Pat, Jordann and Joshua’s dad The culminating event of the program was for each of the four, to have their first flying lesson, one at a time, with a CFI (Certified Flight Instructor). Here is an aerial shot of the school they attend. When Pat (our son), was in third grade, a teacher we knew took him flying in a Piper Archer. That experience eventually led to Pat getting his private pilot license. The husband and wife flight instructor team that soloed Pat and led him to getting his Private Pilot License, are among the most influential teachers Pat ever had. As grandparents, it is a special thrill to know your son and his wife are motivated to provide exciting learning opportunities for their kids. 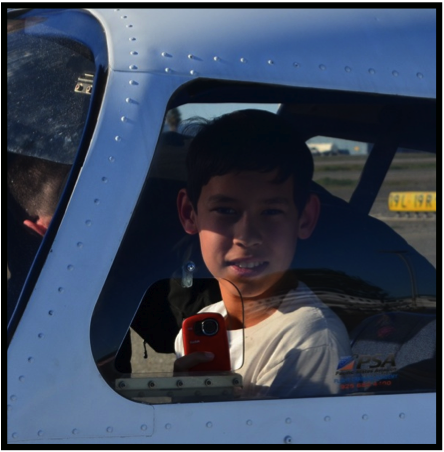 Joshua and Jordann will most likely have goals in life other than becoming professional pilots but the experience of flying with a flight instructor gives them the opportunity to spend time in the adult world and to apply the mathematics and science learned in the classroom. In naming the program, Pat reversed the invitation, ‘learn to fly’, to the education-focused Fly to Learn!. He had the kids use the popular computer flight simulator X-Plane X (for the PC and Mac) to learn the basics of flying a virtual airplane. Using a joystick to control a virtual airplane in flight, the kids learned that the rudder pedals control yaw (nose left-nose right), the elevator and throttle controls pitch (nose up-nose down), and the ailerons control roll (roll right-roll left). After learning the basic flight controls and before ever getting into the left seat of the real airplane, they also learned the names and functions of the six instruments that make up the primary instrument group. They practiced at the computer reading these instruments and observing how the instrument readings changed as they flew the virtual airplane.. 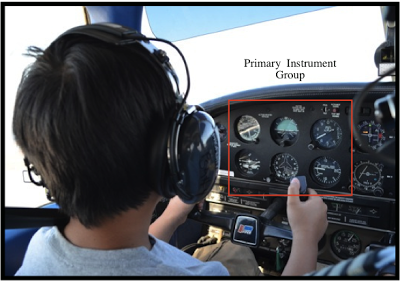 Here is a picture of Joshua in the air, in the real airplane, flying the airplane with the primary instrument group outlined in red, in his direct line of vision. Starting in the upper left corner of the red box and moving clockwise is the airspeed indicator, artificial horizon, altimeter, vertical speed indicator, heading indicator, and bank and turn indicator. The kids know that theses instruments (during a phone conversation I asked Joshua to name them for me and he did) tell them the orientation of the airplane and the direction the airplane is heading. In this picture Jordann is finding the horizon visually and clearing the airspace for a coordinated aileron and rudder turn to the right. Along with straight and level flight, mastering coordinated turns are first on the skill list. The flight instructor, also named Pat, is in the right seat. The airplane has dual controls so he is always there to assist the student pilot. If a youngster is big enough to sit in the seat and reach the rudder pedals he or she can take flying lessons. But you have to be 18 years old to skydive. Joshua and Jordann’s mom and dad are also skydivers. 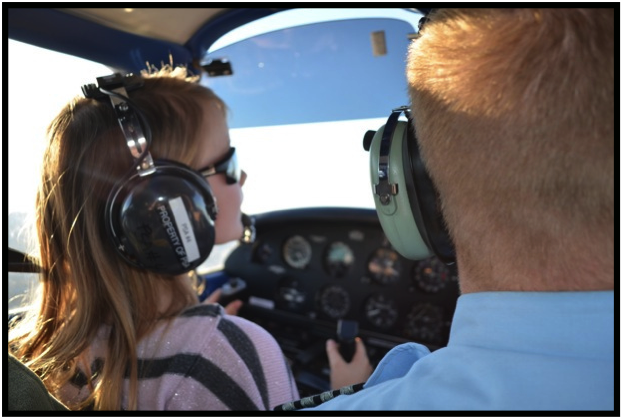 Will the kids ever get a pilot’s license? That’s a few years in the future but who knows, they may not only want to fly airplanes but also want to learn how to jump out of perfectly good airplanes! Now it’s Joshua’s turn to do a coordinated right turn. Learning to fly the airplane by visual inputs provided by looking out the window comes before building instrument flying skills. Bryan is buckled in with the engine running and ready for his flight lesson. 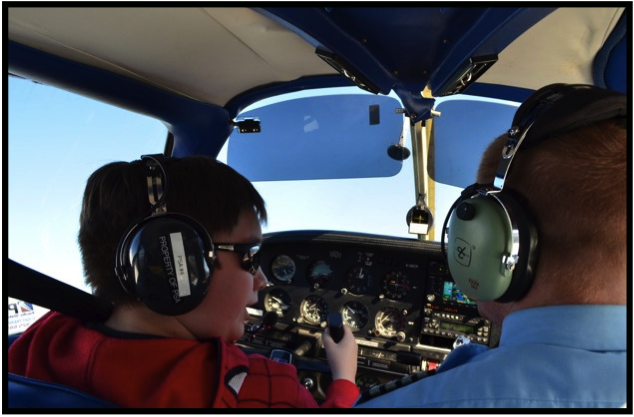 He and instructor Patrick check for traffic to the right as part of preparation for takeoff. Next, Bryan in the air, at the controls, soon after takeoff. Tyler getting ready to taxi out for his flight of the day. Unfortunately I do not have any in-flight photos of Tyler. 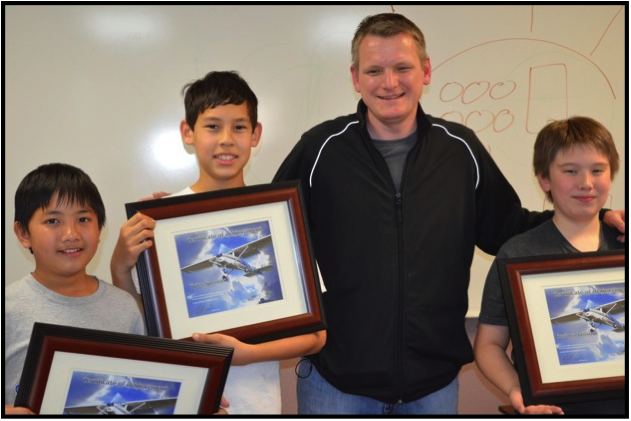 The kids received a framed ‘diploma’ after completing the computer training, ground school, and the first flight lesson. Jordann must have taken the picture because she received a framed diploma too! Pat is with the kids in the photo. 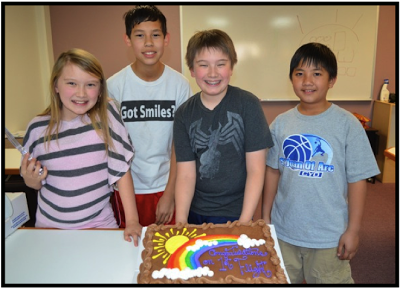 And, what better way is there to end the day and the learning by having a piece of well earned cake! 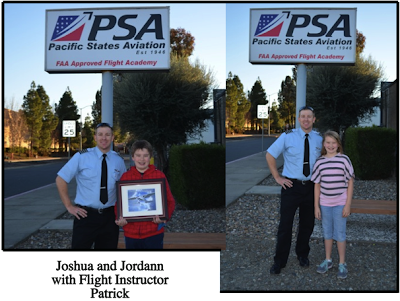 Below, Joshua, Jordann, and flight instructor Patrick pose for diploma pictures under the Pacific States Aviation sign.